I talked about this book on my blog already – very shortly – when I answered some questions for an award and was asked to share the first sentence of my current read at that time. That sentence? “The air is dead with the stench of blood. Mine. His.” I was hooked – right from the start. I was in for the ride of my life, but I didn’t know it yet. All I have to say is: be aware of the triggers, because there are quite a few and I’m mentioning them in my review too. Another thing I’m mentioning right now is that this is the story of a survivor, written by a survivor and this review is also written by a survivor. Had to be said. Read the above? Those first eleven words? Can you see how they pulled me in? If not, then.. something must be wrong with me or with you, hah. Because those words caught my attention and refused to let go for chapters and chapters! I started reading this novel about an hour before bed time and I ended up going to sleep.. three hours late and halfway through My Whole Truth. I couldn’t stop reading at all. I tried, honestly. I put my phone aside three or four times but I just couldn’t fall asleep because I had to know what happened next. That rarely happens! I’m pretty set on going to bed on time, you know.. But enough with the general babbling! The story starts right after Seelie, our main character, escaped her attacker by hitting him on the head with a mallet. After that, everything spirals out of control. 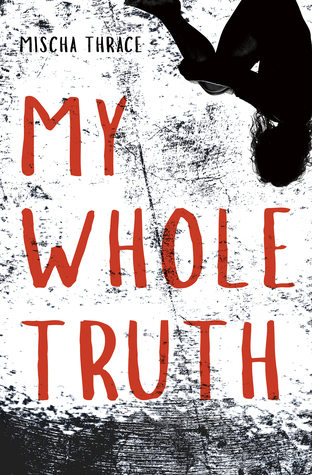 She ends up in the hospital, telling half-truths and not admitting to anyone – even herself – what exactly happened. I needed to know what had happened to her. You immediately get an idea of what could’ve gone down – being sexual assault – but in a way, you keep second-guessing it because some things just.. didn’t add up for me. I was intrigued and curious to see what had taken place. My dreams are a punishment punctuated with flashes of gore and monsters with faces like the insides of cherries. That curiosity is what you need in a mystery novel like this one. If you’re not curious about the outcome, or about what exactly happened in the past, the book’s not well-written and this one is. The fast pace, the little snippets of information you get, the problems and situations Seelie has to face: it all works perfectly and kept a hold on me throughout the entire book. Another aspect I really liked is how Mischa gave Seelie the perfect support system. Even though they don’t know everything that happened, you can see and feel how her friends want to help her through anything coming her way. Her friends – which she calls “the faction”, consists of three unique characters. Each has their own characteristics, beliefs and pasts, which are shown throughout the novel. They do struggle with each other, but what friends don’t? It made their friendship all the more real to me. I have to admit Lyssa’s easily my favorite character though. She’s blunt, has guts, isn’t afraid to protect her friends in whatever way possible. And that’s not even mentioning the slow burn f/f romance. It feels absolutely perfect since Seelie definitely has plenty on her plate and the focus should not be on romance. I loved how the author knew this and let their relationship grow accordingly. My brain can’t convince my tongue to form the words, so they go unspoken. I bypass it completely, as if not saying it might make it so it never happened. I already mentioned one huge trigger, sexual assault, but there are more. They’re at the top of my review, but I do feel like pointing them out again because they are important. They’re huge triggers for a lot of people. Victim-blaming, mental health, bullying, murder, mention of drug-dealing and the biggest one of all – abortion. The last one is in white because it’s a huge spoiler but people need to be warned. I didn’t know about any of these triggers going in and, for once, I honestly didn’t mind. I saw most things coming. Even though it wasn’t easy reading about certain subjects – I already wrote a post in the past regarding the sexual assault I survived – and my pregnant state on top of that, I still feel this story was worth reading. On one hand, I’d like to go further into the one trigger I left in white, but.. let’s keep it at “people can view this part of the book differently since it has a lot to do with one’s own principles, beliefs and past.” I believe it has to be present in the book, I can see why others would think differently but this is my review. We are a chain of broken people trying to keep one another from drowning. There was only one thing annoying me somewhat and that’s Seelie’s relationship with her mom. To say it’s strained is a definite understatement. There isn’t much love lost between those two and.. of course, that’s entirely possible. What annoyed me is how we never get a decent explanation as to why this is the case. Why do they pretty much hate each other? Why is their relationship the way it is? What happened exactly to ruin a mother-daughter bond so thoroughly? There are some vague hints given but.. It wasn’t enough to satisfy my curiosity. I am so afraid of what the truth will to do us. I can only conclude that this is a book worth reading. It’s the story of a survivor, written by a survivor. Stories like this one are important, worth sharing and I’m so, so happy to find this book one I can absolutely agree with. Yes, I’m ordering myself a finished copy. I need this on my shelves. How often do you read books of which you know they might trigger you? Do you find yourself feeling happy about reading them, or do you regret it most of the time? I would definitely read this book! It sounds so important. I’ve read a book that definitely has a lot of trigger warnings or big ones (@ The Female of the Species) but I do want to be informed by them so I go for it. Thank you for the amazing review! It, without a doubt, is! I just had to get myself a finished copy after reading the eARC and that’s something I.. don’t do all that often. Going to check that one out! Great review, Kathy. This definitely sounds like a story worth reading. I sometimes find myself reading books that’ll trigger me too, probably to learn how the characters cope with them and to see how I can apply those mechanisms in my life 🙂. I’m glad that you were able to read this book and share this review with us ❤️. The first line of this book has me hooked already, so much so that it’s now on my TBR and I’m going to pick it up as soon as I can when it’s released in a month! It’s like you said – stories like these, about a survivor that’s written by a survivor, are so important and need to be heard. Your review was just the icing on the cake. I liked how you didn’t give too much away about the story but were still able to highlight the importance of it. Personally, I read books I know are going to trigger me as often as I can because I want to be able to overcome it to the point where it’s not a trigger anymore, at least that way it’s on my terms and I can take my time with it, although it does take me a while and I have to build up to doing it. But I can see why some people don’t, it’s all depending on what the trigger is and what impact it has on a person, but I totally commend anyone who reads a book that is a potential trigger to them because that’s not easy. Since I’m a huge fan of cake, I can only be ridiculously happy to be the icing on this one! I totally see where you’re coming from. I try reading books that trigger me as well because of that reason and because I feel it’s important people get to see reviews by readers who lived through certain things themselves. It can help a lot when deciding whether or not to pick up a book yourself.